Total dry recycling tonnage increased over the period of the campaign. 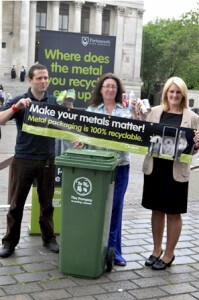 The average percentage of metals in the dry recycling stream rose by 12.7% over the period of the campaign. 450 households in three areas recorded a 12% increase in the number of houses recycling cans. The increase in metals captured will offset the cost of the campaign within 12 months. Portsmouth City Council, Project Integra — a partnership working to provide an integrated approach to the collection, treatment and disposal of municipal waste in Hampshire.